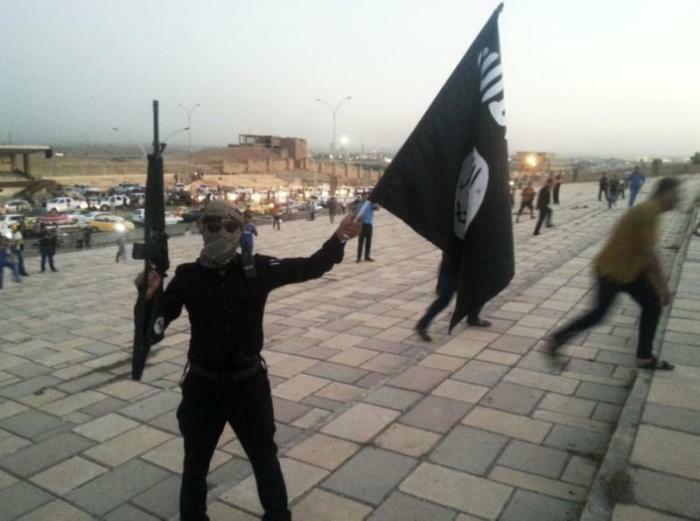 An American from New Jersey is believed to have climbed the ranks and become a senior commander for the Islamic State terror group, officials said. The Atlantic reported on federal court records revealing that Zulfi Hoxha, the son of an Albanian-American pizza shop owner, left the U.S. on April 6, 2015. Only four days later, he joined an IS training camp. Half a year later, he is believed to have appeared in an IS training video, where he is seen beheading Kurdish soldiers. While a number of other U.S. citizens have been caught fighting for IS, if officials are correct, Hoxha will be the first American to have carried out beheadings in such a video. The 45-minute video, titled “We Will Surely Guide Them To Our Ways,” was released by IS’ media office in Iraq’s Nineveh province. One of the masked men, called “Abu Hamza al-Amriki,” slams U.S.-led efforts against IS. “Are you incapable of stabbing a kaffir (non-Muslim) with a knife, throwing him off of a building, or running him over with a car? Liberate yourself from hellfire by killing a kaffir,” the man urges. Hoxha is believed to have been 25 years old at the time of the video. U.S. law enforcement says he has now become an “ISIS senior commander.” It is not known how he was able to ascend, though The Atlantic suggested his willingness to carry out beheadings of enemy soldiers could have impressed IS leadership. Many other American IS supporters have carried out "lone wolf" style attacks in the U.S., while others have been arrested in their attempts to travel to Iraq and Syria. The New York Times reported on another case last week, concerning a 16-year-old American boy fighting for IS captured in Syria. Officials are still looking to confirm his identity, but if proven, he would be the first minor American citizen caught fighting on behalf of the Islamic extremists. Previously, a 15-year-old girl from Kansas, who wasn't named, was forced to travel to Syria by her father, where she was forcibly married to an ISIS fighter. When she was captured by officials, she was pregnant. Back in October 2017, a 27-year-old man from Virginia became the first U.S. citizen to be convicted of successfully joining IS. Mohamad Khweis, who joined IS in Syria in 2015, was sentenced to 20 years in prison at the time. "This defendant executed his plan to perfection. He got into the Islamic State. He was in their machinery. He was providing himself and his services to the organization," said prosecutor Dennis Fitzpatrick. In his defense, Khweis insisted that he did not fight for IS, and all he wanted to do was to experience the "caliphate."